Good morning Julian, I had a smile on my face as I read your post.....I had come against and done things you had described in our post. Just the other day I had to make a solder bridge. It was for my Qrpometer from the 4stateqrp kits. In the building of my K2 solder bridges seem to be easy to come by.....but could I do one when I had to NO!!! I kept ending up with 2 separate blobs of solder. The only progress that I seem to make was lager blobs of solder. With my K3 I did the mod for adding the P3 with the SVGA card installed. The K3 would shut down on overload but there was a mod for that. I did the mod an then tested the rig. There was no output. My worst dream seemed to come true.....I screwed up my K3!!! After about 45 minutes I realized my rig was in test mode which does not allow the rig to transmit. It was time to shower after having worked up a HUGE sweat. There is a trick (as you know) to obtain the normally desired smooth solder joints, and that is the use of flux. And, the opposite is ALSO true for making solder bridges. 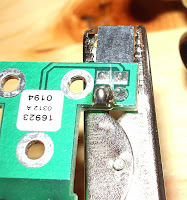 After tinning the pads with a little excess solder, remove the flux and allow the solder to oxidize a bit by melting the solder with a dry iron. Then you can drag the solder where every you want (or not). In other words, use the un-learned techniques of your younger years and your first experiments that typically produced cold solder joints. Julian it is good to hear and see you working on things !